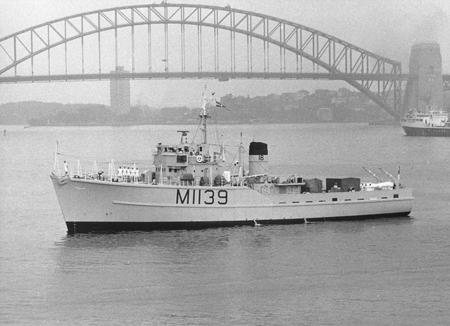 HMAS Hawk was one of six ex-Royal Navy Ton-class minesweepers acquired by the Royal Australian Navy (RAN). Her sister ships were HMA Ships Curlew, Gull, Snipe, Ibis and Teal. The six Ton-class minesweepers formed the 16th Mine Countermeasures (MCM) Squadron and provided the RAN with the means to gain and maintain proficiency in mine countermeasures. Hawk was originally accepted into Royal Navy service as HMS Somerleyton on 1 September 1956. 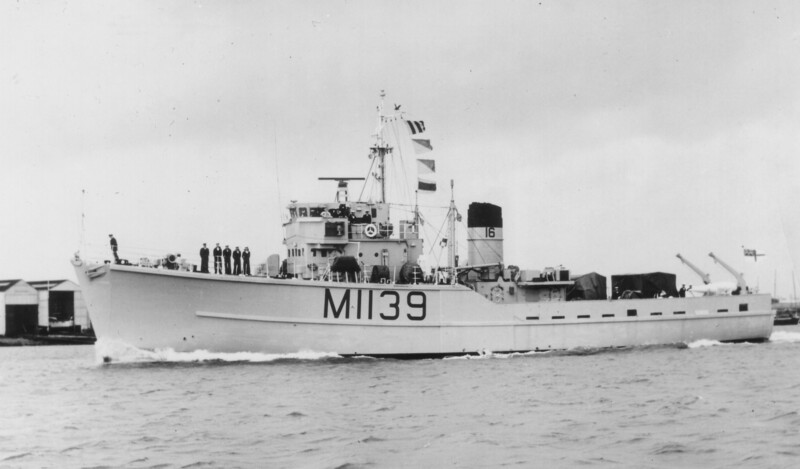 Upon completion of trials she was moved to Camper and Nicholson Ltd, Northern Yard, for preservation and storage in the Reserve Fleet at Hythe and purchased by the RAN in 1961. The Naval Board had originally intended to name her Crane, but since a Royal Navy frigate already carried that name, the decision was made to change it. 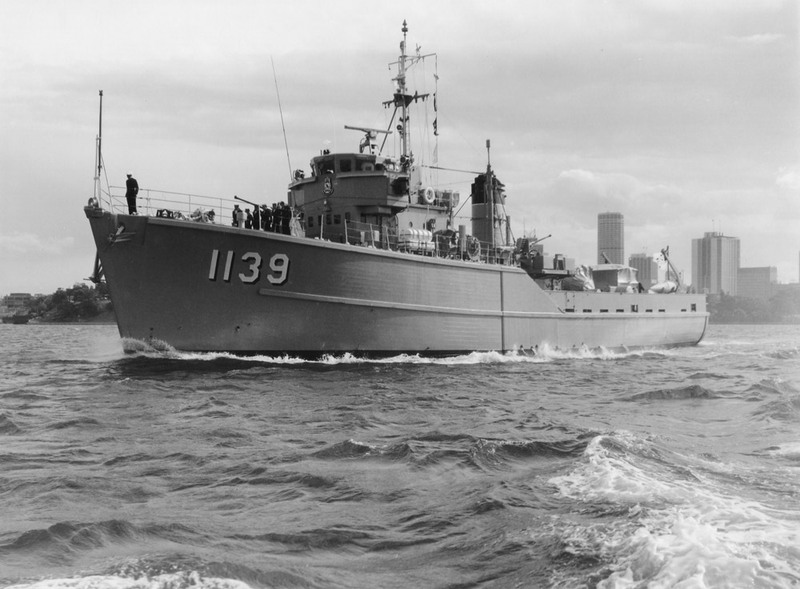 Commissioned as HMAS Hawk at Lowestoft on 18 July 1962, under the command of Lieutenant Commander DA Ross, RAN, she became the leader of the RAN's newly formed 16th MCM Squadron. She arrived in Australia with her sister ships on 7 December 1962. HMAS Hawk departs the UK, bound for Australia. 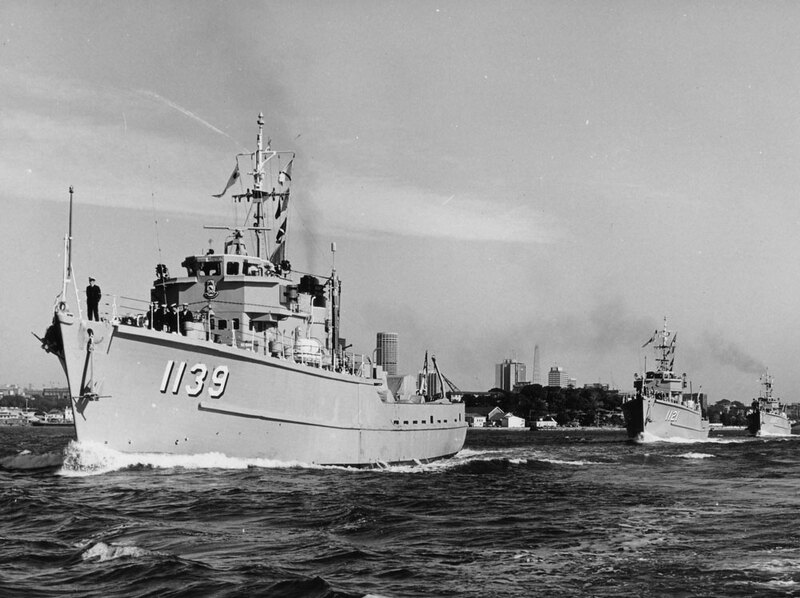 Hawk operated on the east coast of Australia from February to early June 1963 conducting manoeuvres and mine countermeasures exercises with her sister ships and providing training for classes from HMAS Watson, prior to entering Garden Island Dockyard for refit. 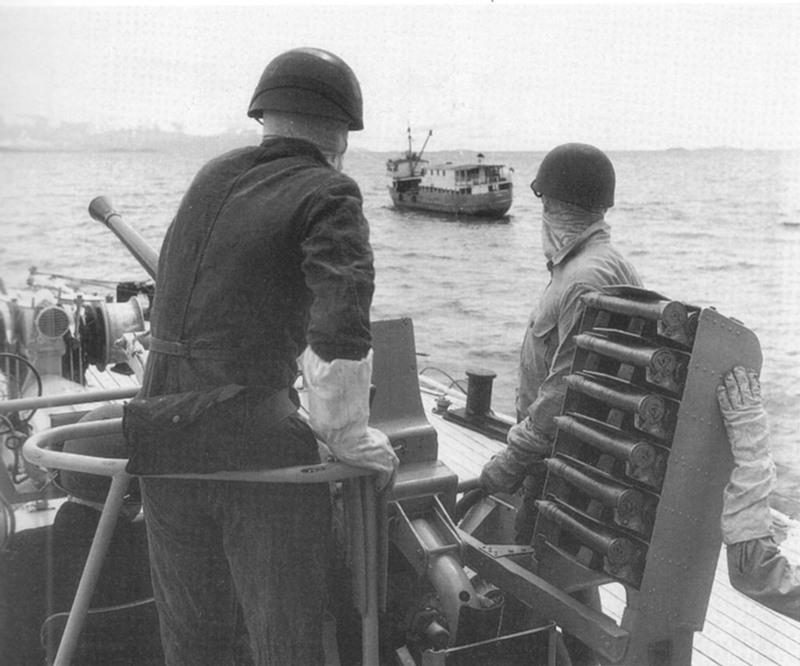 Exercises in the Jervis Bay area occupied early September until Hawk and her sister ships sailed for their first overseasdeployment on 20 September 1963 as part of Operation GARDENING, a minesweeping task to clear a channel into Tonolei Harbour in Bougainville, where US aircraft had dropped a large number of magnetic mines in 1943. This was the RAN's biggest minesweeping operation for 16 years. The deployment also included overseas port visits to Singapore and Port Moresby, and the conduct of hydrographic surveys in the Solomon Sea and Chestnut Bay (125 miles south east of Port Moresby). The Squadron returned to Sydney that December and Hawk commenced a mid-cycle docking. HMAS Hawk, in company with HMA Ships Curlew and Snipe, leaving Sydney. In February 1964, Hawk participated in mine countermeasures exercises off the east coast of Australia. These were suspended, however, from 11-13 February as she assisted in the search for survivors of the Melbourne (II)/ Voyager (II) disaster. During the search, Hawk recovered the body of Voyager’s Commanding Officer, the late Captain DH Stevens, RAN. Hawk then returned to a routine exercise and maintenance programme until mid-April when she docked for repairs to her underwater nylon sheathing. On 1 May 1964, and in company with Gull, Hawk sailed for her first Far East Strategic Reserve deployment as part of Australia’s commitment to Commonwealth support for Malaysia during the Indonesian Confrontation. The two MCMs began their patrol duties on 9 June and were relieved by their sister ships, Ibis and Teal, on 30 August. 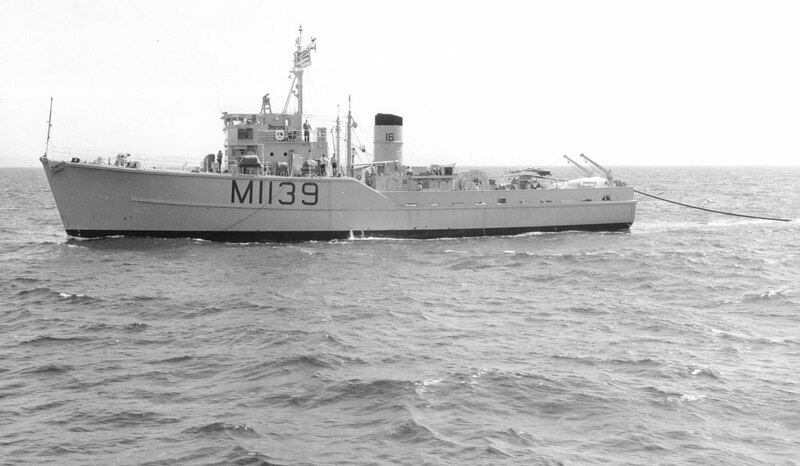 On her return to Sydney in late September, Hawk entered Garden Island Dockyard for a refit prior to redeploying to the Far East from January to August 1965. Hawk again returned to the Far East in January 1966. During this deployment, the Naval Board decided that, rather than ships wasting time and resources returning to Australia between deployments, the ships would remain on station and crew changes and any necessary maintenance would occur at one of the Royal Navy bases in Singapore or Hong Kong. HMAS Hawk's Bofors Gun crew at the ready as the ship intercepts another vessal near Borneo. Whilst most patrols during these deployments were uneventful, on 13 March 1966 while patrolling off Raffles Light, Hawk came under fire by an Indonesian shore battery, even though she was inside Singaporean territorial waters. Eleven rounds were fired at the ship, landing within 200 yards. In this instance, Hawk did not retaliate. The following month, however, retaliate she did. Hawk was ordered to patrol in East Malaysian waters near Nanukan Island north of the median line. Embarked was a detachment of four Ghurkhas who were to man two assault boats as observation posts during night patrols. On 7 April, the Ghurkhas came under Indonesian mortar fire from Nanukan Island. The Indonesian fire ceased when Hawk fired some warning shots from her 40mm Bofors into the sea. The following evening, Hawk and the Ghurkhas again came under Indonesian mortar fire, this time more accurate and more intense. On this occasion, Hawk returned fire for effect, engaging Indonesian targets with 30 rounds from her Bofors. The mortar fire quickly ceased. On 13 August 1966, following ratification of the Bangkok Accord, orders for the cessation of patrols were received. 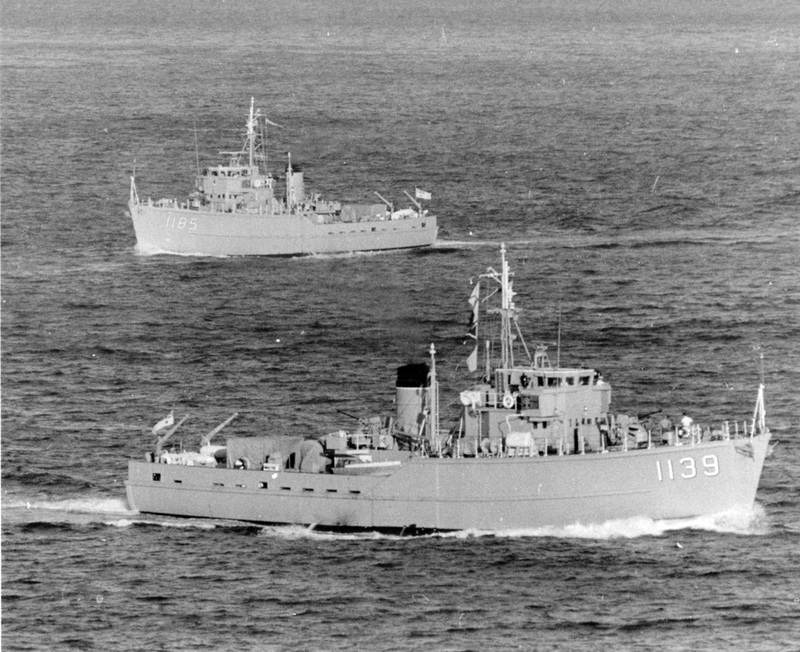 Hawk and Gull remained in the Strategic Reserve, however, undertaking tasks such as Duty Coastal Minesweeper until early April 1967 when they departed for Sydney. HMAS Hawk exercising in company with HMAS Gull. On 28 April 1967, Hawk berthed at Waterhen after an absence of 16 months and having steamed over 38,000 nautical miles since departing Sydney in 1966. Upon returning to Australia, and due to maintenance costs and personnel shortages, Hawk was paid off into operational reserve on 5 May 1967. On 16 February 1968, however, she was recommissioned into active service under the command of Lieutenant Commander CC Pidler. The following weeks were busy for Hawk and her new crew with a wide range of evolutions and exercises on the Australian coast. During two weeks in mid-March Hawk also assumed a non-naval role as flagship for the Olympic Sailing Trials which took place in Botany Bay. From late April until early July 1968, and in company with Gull and Snipe, Hawk completed a South East Asian deployment during which she participated in Exercises SMALL FRY and SHORT PLAY with units from the Royal Navy, and the United States and Philippines Navies. Hawk deployed overseas once again to Papua New Guinea in September in company with Gull and Snipe where the three MCMs swept an approach channel to Marshall Lagoon. She operated in Australian waters for the remainder of the year, participating in Exercise SHADOW in October and a National Mapping Survey of the Coral Sea and outer Barrier Reef in November. HMAS Hawk conducting a sweep. On 17 March 1969, Hawk, in company with Gull and Curlew, once again deployed for the Far East. The three ships took the more circuitous route along Australia’s southern coastline enabling them to survey an approach channel off Anglesea, Victoria. They arrived in Singapore on 21 April to participate in Exercise JUGGLER in East Malaysian waters with units from the Royal Navy and Royal Malaysian Navy, and the South East Asia Treaty Organisation Exercise SEA SPIRIT involving more than 60 naval units from Australia, New Zealand, the Philippines, Thailand, the United Kingdom and the United States. On 3 June 1969, the SEATO exercise was postponed following the HMAS Melbourne (II)/USS Frank E Evans collision. The mine countermeasures phase of the exercise recommenced the following day. Hawk arrived home on 1 July. During the period 25-28 August 1969, Hawk, together with other RAN units, was involved in a search for survivors from the merchant vessel, Noongah, which had foundered in heavy seas off Smoky Cape. She sailed for her final deployment prior to decommissioning on 30 August to conduct a National Mapping Offshore Survey of the Coral Sea area. On 7 November 1969 Hawk was paid off into operational reserve. On 18 September 1970, however, after less than a year in reserve, Hawk was once again recommissioned into service, reassuming her role as the MCM Squadron’s Senior Ship under the command of Lieutenant Commander WDH Lees, RAN. HMAS Hawk departing Sydney Harbour. Hawk operated in Australian waters until 28 May 1971 when she deployed to Papua New Guinea, in company with Curlew and Snipe, to conduct a Mine Warfare Pilotage Survey and South West Pacific deployment during which they provided aid to the civil power in New Britain, Rabaul, in the aftermath of an earthquake. On 1 November 1971, Hawk commenced a refit at Garden Island Dockyard. On 7 January 1972, Hawk was, once again, paid off into operational reserve having steamed 193,867 nautical miles in RAN service. Hawk remained in the Reserve Fleet until 1976, when she was sold and broken up for salvage at Maclean on the Clarence River, northern NSW. Sail oe'r the ocean blue. At over thirty knots per hour. And deserving of no shame. For the country of the free. The other ships can't go.
' "Hands to Boarding Stations!" The Story of Minesweeper HMAS Hawk' by John Foster - published by Australian Miltary History Publications, NSW, Australia, 2003.